“The ultimate goal of the Axiomatic Design is to establish a science base for design and to improve design activities by providing the designer with 1) a theoretical foundation based on logical and rational thought processes and 2) tools.” [Suh, 1990] While there are many steps in the engineering design process, the axiomatic design process focuses on the generation of requirements and the selection of means for achievement. One of the central ideas of axiomatic design is the importance of distinguishing between what (objectives) is to be achieved and how (means) it will be achieved. In axiomatic design terminology, the objectives of the design are expressed as Functional Requirements (FR’s) and the solutions are expressed as Design Parameters (DP’s). The design process is one of selecting the best set of DP’s to satisfy the determined FR’s. It was found that the strengths of axiomatic design, namely the emphasis on separating the objectives (the FR’s) from the means (DP’s) and the structured decomposition process, made it particularly well suited to achieve the proposed research objectives. The following paragraphs provide a brief introduction into the axiomatic design methodology and explain the usage during the development of the MSDD. For more detail on the axiomatic design methodology, the reader is directed to the work of [Suh, 1990]. The functional requirements (FRs) represent the goals of the design or what we want to achieve. The design parameters (DPs)express how we want to satisfy the functional requirements. The FRs and DPs can mathematically be described as a vector. The relationship between the FRs and the DPs can be stated as a matrix. This matrix is called the Design Matrix (DM). Design - as used in the axiomatic design - is defined as the mapping process from the functional space to the physical space to satisfy the designer-specified functional requirements. The independence axiom: Maintain the independence of the functional requirements. The first axiom states that when multiple FR’s exist, the design solution must be such that each FR can be satisfied without affecting the other FR’s. When this objective is achieved, the design matrix will be diagonal, as each DP will affect only its associated FR with no coupling occurring in the off-diagonal elements. Such a design is said to be uncoupled. In cases where independence is not achieved, two possibilities arise. In one case, the design will be partially coupled, meaning that the rows and columns of the design matrix can be interchanged such that the matrix is upper or lower triangular. When off-diagonal elements exist and the matrix cannot be rearranged to a triangular state, the design is said to be coupled. An acceptable design is either uncoupled or partially coupled. A partially coupled design is said to be path dependent. The information axiom states simply that simpler designs are better. Quantifying the complexity or information content of system designs can be quite challenging, however. The information axiom was not used in creating the MSDD and thus will not be discussed further herein. The axiomatic design methodology begins with the identification of customer needs and the conversion of these needs into a set of one or more high-level functional requirements. The goal is to develop the minimum set of independently achieved requirements that completely characterize the desired functions of the design [Suh, 1990]. Suh describes achieving this result as a process of first mapping from the customer domain to the functional domain to state (objectives) functional requirements (FR’s) in solution-neutral terms. Next, the designers must determinehow the just-determined FR’s will be met by the (means) design parameters (DP’s). Synthesis of design parameters is essentially a creative process. At high levels, the DP’s may be conceptual in nature and may describe a general system or structure for achieving an FR without yet containing enough information to be implemented. At lower levels of decomposition, DP’s typically describe a physical solution in enough detail for a concept to be implemented. Typically, decomposition proceeds until all FR’s and DP’s have been decomposed to an operational level of detail. The binary elements of the design matrix, expressed as X’s and 0’s, indicate the presence or absence of a relationship between a DP and the associated FR. X’s should always be present along the diagonal, meaning that each DP affects its associated FR (e.g., A11=X indicates that DP1 affects FR1). The X at A21 shows that DP1 also affects FR2. This design matrix information can also be represented graphically. An arrow from a DP to an FR indicates the presence of a non-zero, off-diagonal element in the design matrix. For example, Figure 3 provides the graphical representation of the design matrix shown in equation 2. Figure 1: Graphical representation of design matrix of equation (2). An arrow from a DP to a FR indicates the presence of a non-zero off diagonal element in the design matrix. The designs can be represented mathematically and graphically as shown in Figure 2. The differences between the three kinds can be explained by showing the adjustment of the FRs. This is demonstrated in the lower half of Figure 2. 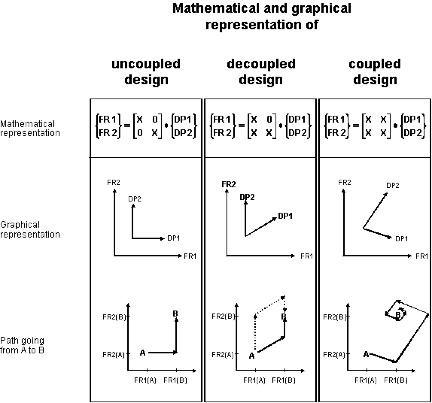 Figure 2: The mathematical and graphical representation of the mapping process highlights the three different kinds of design: uncoupled, decoupled and coupled. The illustration of the different adjustments for an uncoupled, decoupled and coupled design highlights why the design must maintain the independence of the functional requirements. It eases the adjustment of the functional requirements. The independence axiom elaborates if the design is an uncoupled, decoupled or coupled design. A coupled design is not acceptable and the selection process of DPs must be repeated. A decoupled design is worse than an uncoupled but still allows the exact adjustment of the functional requirements. The next step in the applying axiomatic design process is the decomposition is illustrated in Figure 3. 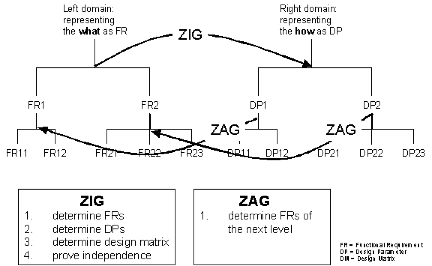 Figure 3: The decomposition process of axiomatic design is also called zig-zagging. Does the particular choice of DPj affect system performance in terms of FRi? Would failing to implement DPj impede the manufacturing system’s ability to satisfy FR? Once a set of DP’s has been determined, the next step is to decide if further decomposition is necessary. In the case of the MSDD, decomposition proceeds for as long as it is possible to do so without limiting the usefulness or range of applicability of the decomposition. When further decomposition is needed, the next step is to develop the next level of FR’s. By following a downward path in the MSDD (shown in Appendix A), one can see this alternation back and forth between FR’s and DP’s. What are the components of the parent FR and/or DP? What requirements are placed on these components? Reading from left to right, the MSDD indicates path dependence. The FR-DP pairs on each level are arranged in such a way that the pair whose DP influences the most FR’s is on the left side. We see that quality, then problem resolution, then predictable output, then throughput time reduction, then labor reduction are critical to implementing the desired system-design goals (see MSDD include link to the complete MSDD). As a result, decisions should be made following the MSDD from left to right. A summary of the axiomatic design process for decomposition is shown in Figure 4.